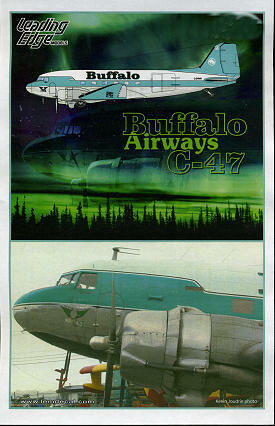 Though I have never seen it, there is a television show called 'Ice Pilots' and the aircraft that they use is a Buffalo Airways C-47. Buffalo is an actual cargo carrying operation that is used to bring supplies and personnel to many of the various outlying mining and other commercial operations in the sparsely populated areas of Northern Canada. They fly several other types besides the C-47, but it is the C-47, with its long history of reliability and public recognition that is, for some, the real star of the show. Leading Edge has worked closely with Buffalo to ensure the highest degree of accuracy in terms of the colors and markings of this subject. 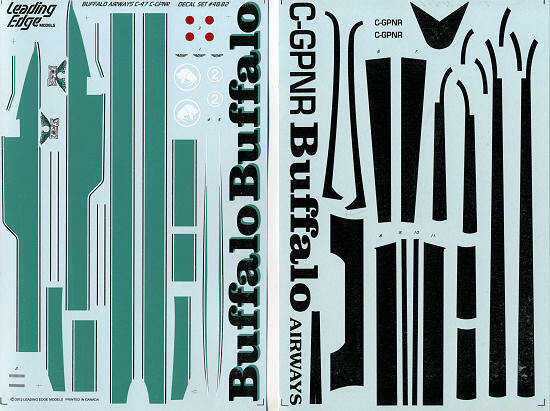 The sheet provides all of the various stripes and bands used on the real plane, and even includes the deicing strips and various undersurface bands as a guide for painting. A nice touch is a section of patch decal that always seems to come in handy. The teal green color for the wings and tail need to be painted on. There is no ready paint to match this color, so Leading Edge provides a mixing guide using Tamiya paints that will at least get you close. You may have to adjust it a bit to completely match the decal. A number of photos of the plane are included to ensure that you get all the small modifications done to this aircraft as well as ensure the proper alignment of the decals. In all, it makes for an excellent sheet for the venerable C-47. For kits, 1/48 modelers pretty well will be picking between the venerable Monogram kit or the newer Trumpeter version. I am thinking that most will choose the Monogram kit as it is more easily available.